Everest Three Passes Trekking is challenging and arduous trek designed for adventure lovers which encompasses 3 different high passes – Khangma-La Pass (5535m), Chola-La pass (5368m) and Renjo La pass (5338m) which are not counted on the standard Everest trail. The highlights of this trek takes you to the Everest Base Camp, authentic Sherpa culture, highland monasteries, sacred maniwalls, Sagarmatha National Park, Kalapattar for whole view of Everest, glacial walk over Khumbu Glacier, beautiful Gokyo lakes and Gokyo Ri. It is popular for its spectacular sceneries of surrounding mountains and the risk involved while crossing the glacieted crevasses. Everest Three Passes Trek begins after a short and scenic flight from Kathmandu to Lukla. At start trail follows the path along the Dudh Koshi river. Crossing Phakding village and through Sagarmatha National Park we reach all the way to Namche Bazaar. From Namche we head towards Tengboche, a sacred spot at high altitude offering panoramic view of Mt. Everest, Nuptse and Ama Dablam. We take downhill path through forest of Rhododendron to Dingboche and then to Chhukung following Kongma La Pass(5540m) from where we descend steeply Khumbu Glacier to reach Lobuche. We can see magnificent mountain surrounding us from the pass. We ascend through glacier to Gorakshep and further to Everest Base Camp. Then we trek back to Gorakshep and head to Kalapathar for excellent views of Mt. 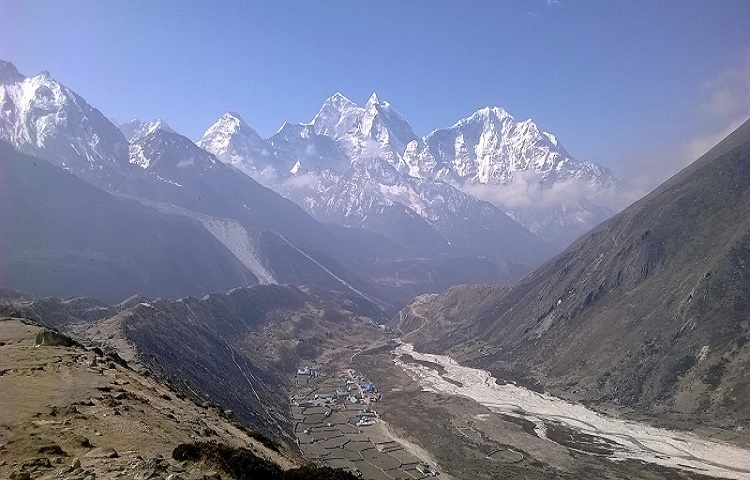 Everest, Ama Dablam, Nuptse, Pumori, Khumbu Glacier and many other mountains. After staying overnight at Dzonglha we trek to Cho La pass. At the top of pass we cross the icy sloping surface of the glacier and reach to Thangnag. Now the path is across Ngozumpa glacier, largest in the Nepal Himalayas, taking us to Gokyo valley and then to Gokyo Ri from where 360 degree of Himalayan Panorama is seen. Aftre a great time we continue to Renzo La Pass(5345m). The Renjo la crossing is a tough but you get rewarded with stunning view of parades of Himalayan giants including Mt. Everest with pristine Gokyo lakes at single frame. Afterwards we descend to Lungden and trek to Thame, Monjo and finally to Lukla. Everest High Pass Trek sweetens your trek with colors all around; you will meet friendly Sherpa people, picturesque villages and nice variety of culture and traditions that cannot be found anywhere else through Everest 3 high passes trek. Though tough the scenery is a reward of lifetime experience. After early morning breakfast we do a small scenic flight of 40 minutes to Lukla.If you are lucky then you get to see the spectacular views of mountains and the deep gorges. We begin our trek from Lukla alongside Dudh Koshi river. 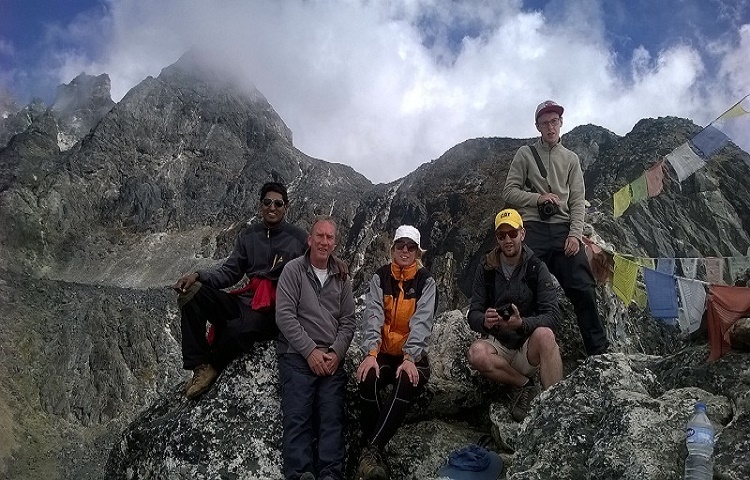 During the trek you will get the chance to visualize the crystal clear mountains like Mt. Nupla(5885m) , Kusum Kangaru(6367m), and mount Kwongde range. After that the easy walk for two hours will take you to the Phakding village. Overnight at guest house. The trek starts from Phakding making the dudhkoshi river north on the way. We will cross the small suspension bridge twice before reaching the village Monjo the entrance of Sagarmatha National Park. After that we ascend towards Jhorsallle. This trail passes waterfalls and different richy scenic beauty places. The village is rich in magnificent forest of Rhododendron, Magnolia and Fir. Then we ascend towards beautiful village Namche Bazzar(3440m). This destination is very rich in spectacular views and is very comfortable place to spend second night of the trek. After the breakfast we ascend through the trail of Tarngga, gentle stroll from Thame. Then we will cross Marulung(4200m) on east bank of Bhotekoshi. The final descent to Lungden brings a narrow valley clogged with giant boulders. We can observe varieties of plants and animals with unique Sherpa culture during the trail. After crossing you will descend Renjo la pass where an eye popping vistas awaits. Crossing an iron bridge over a stream the trial levels out as it follows the valley past the first lake, known as Longpongo at 4690m, where we get chance to observe the Lama footprints on a stone. The second lake, Taboche Tsho surprises us by the shimmering turquoise blue sheet of water sparkling in the sun. After then we reach the third lake, called Dudh Pokhari, linked by a surging stream to the previous one. Gokyo village stands by the third lake and Cho-Oyu Mountain. We see the panoramic views of Cho Oyu,Gyachung Kang, Lhotse, Makalu, cholatse and Tawache above the lake. Today we spend a day in Gokyo wandering around the lakes and hiking up to some of the mountain viewpoints nearby. Today we start the trek in morning and ascend about 30min to reach the top with its traditional prayer flags. View the Ngozumpa glacier, the biggest glacier of Nepal. Definitely we would not miss the chance to observe the fourth lake (Thonak Tsho) and fifth lake (Ngozuma Tsho). From where you will have a mesmerizing view of highest peaks, from the west to east are Cho you (8,153m), Gyachung Kang (7,922m), Everest ( 8848m), Lhotse (8,501m) and further way Makalu. We will trek down to Thangnak today, enjoying superb view of Gokyo Lake. We will cross Gokyo glacier, about 4 hour working down to Thangnak for the night stay. The first step is gentle stroll between snowy peaks that seem almost close enough to touch. The trail runs east past a series of ominous looking black boulders beneath the looking peak of Cholatse. You can turn around to see the Ama Dablam (6856m). About 4 and half hour slowly working takes you Lobuche (4910m). On the way you will see Dughla Lake.We will see Lobuche peak rich in glacier down the stream. Tawoche and Nuptse are particularly spectacularly from Lobuche towering. The first section of the trail from Lobuche follows the narrow gap between the glacial moraine and the mountain walls, past turn off to the Italian pyramid. Along with windy and rocky path you will experience the mesmerizing view of Mt. Pumori, Nuptse and other magnificent peaks, we reach Gorakshep. Gorakshep is the location of the original Everest Base Camp with the new camp being further up the valley.After lunch our adventure continues towards Everest Base Camp. The trial is like rocky dunes and moraine and streams. The Base Camp area provides an opportunity to experience the freezing and harsh conditions that mountaineers brave to summit this famous mountain. We explore base camp and its surroundings glacier and return back to Gorakshep. It is around 7-8 hrs trail today. Mornings are usually sparkling and clear and this is the best time to climb the Kalapathar for one of the world's definitive mountain views. We will experience 360 degree panoramic views of Mt Everest and surroundings mountains like Mt. Pumori, Mt. Lingtren, Mt. Khumbetse, Mt. Nuptse, Mt. Lhotse, Mt. Ama Dablam, Mt. Thamserku along with many other peaks for Kalapatthat. Then you will have an easy walk for about 2hrs to reach Lobuche. From Lobuche it is easy ascending. We will pass through small freezing lakes today. The trail descends to Khongma la Pass. A Crain mummy-wrapped in prayer flags marks the pass. Then its a full descending to the east side of Niyang khola valley. There are great views across the valley to Island peak and jagged ridge of Amphu lapcha (5845m). We will go to Chhukung for our night destination. We will meet climbers preparing for Island Peak climbing. We go downwards the valley of the Imja Khola, and trek through the village of Dingboche with its stone walled potatoe fields, down alpine pastures through the Kharkas of Tsura, Orsho and Shomare to the village of Pangboche, the highest year round settlement in the valley. 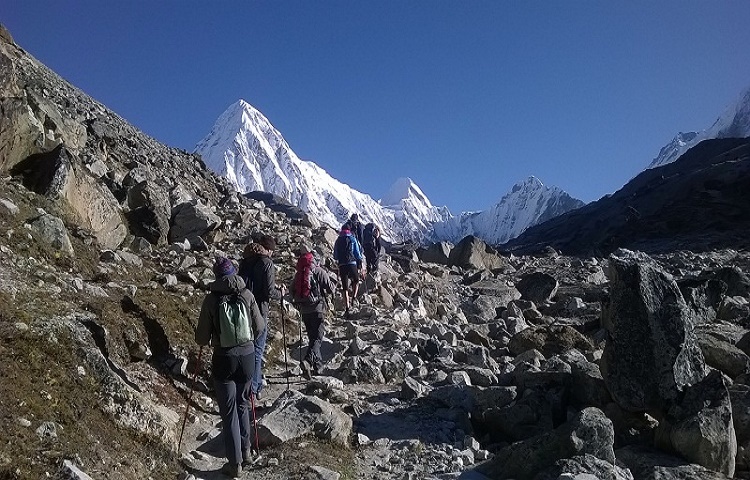 From the view point we will get experience to see distinctive peaks like Amadablam (6856m), standing proud of the massif containing Everest (8848m), Nuptse (7861m), Lhotse (8501m) and inspiring views of Himalayas. We will visit the Buddhist Monastery at Tengboche, the largest in Khumbu region. After crossing the suspension bridge over the Dudh Koshi River trek onwards to the Kyanjuma the junction of the triple ways to Gokyo Valley, Khumjung village and Namche Bazzar. Its a habitat to wildlife of some species of Pheasants, Himalayan Griffons, Musk deer and wild goat can be found abundance inside the rhododendron forest. Evening explore small surrounding area with magnificent scenery. Overnight at Namche. We descend from Namche to the Dudh koshi can be the hardest stage of the entire trek. Although the path is all downhill the downward slope places massive impact on the knees. Once you cross the high suspension bridge, the path runs mostly level. We will walk though rhododendron and pine forests with the view of distance snow covered peak before arriving Phakding. We will enjoy the lush green forests around and passing through the incredible mountain scenery and local Sherpa village before arrival in Lukla. You'll have time wander around the local areas. In the evening you can enjoy a typical Nepalese dinner and cultural show. Saying final goodbye to our porters, we will have a flight back to kathmandu that takes time upto 40 minutes. (It also can be a spare day in case of bad weather in Lukla which makes the Lukla flight delayed and cancel. At the evening we will have the farewell dinner and discuss for your next destination for your arrival once again.